One of the greatest joys of running a sawmill (in addition to exercise and fresh air), is opening up a log to see the beauty inside. Often, I’ll have to stop, brush the sawdust off the log and take a minute to admire the grain and color of an unusual log. Some, like the fork in a black walnut, yield a beautiful feathered grain if you turn it just right. Others, like hedge (a.k.a. 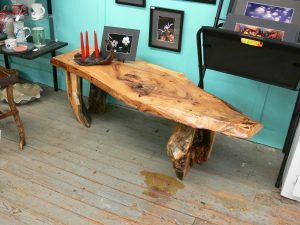 Osage orange) grow every way but straight, and produce curved pieces that bring out the gleam in the eye of an experienced woodworker looking for a truly unique piece of wood for a sculpture or piece of furniture. Cutting cookies. Notice that the oval shape is turned so that the wood is supported by the back support board. Some of these cookies just might wind up under a wedding cake! diameter logs cut to firewood length, or “cookies” (cross section disks or ovals)? These are generally thrown on the “cut for firewood” pile, and all that beauty never sees the light of day. That means you not only have a ready supply of unique logs, but you can often get them for next to nothing! Once you bring them home, the next question is, “How the heck to I even clamp this thing down so I can cut it?” The trick is to think outside the box (or outside the log). You will probably find your own techniques, but here are a few ideas to get you started. 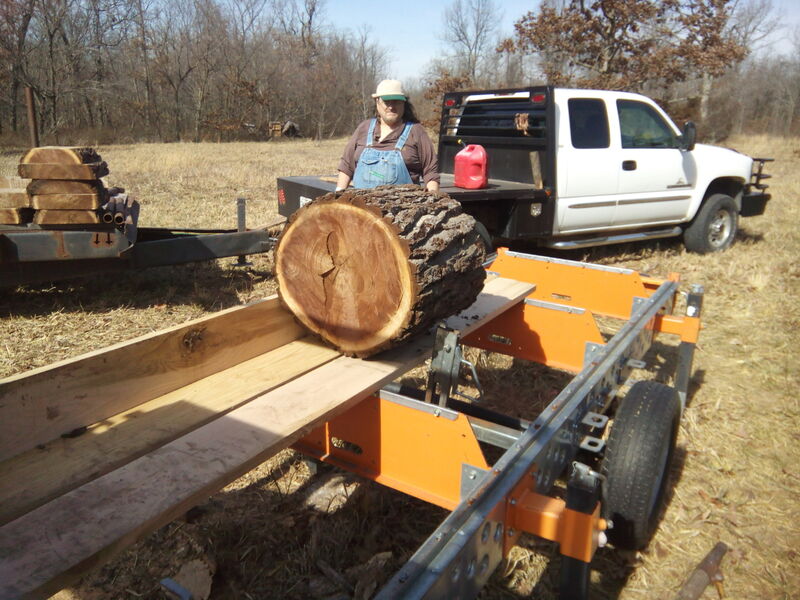 Big diameter, short length: few mills would even bother with a log like this one, which means you may be able to get similar logs for firewood prices. to clamping down a forked piece of wood is to get the three centers of the growth rings (the stem and the two sides of the fork) all in the same plane as the blade, parallel to the track. 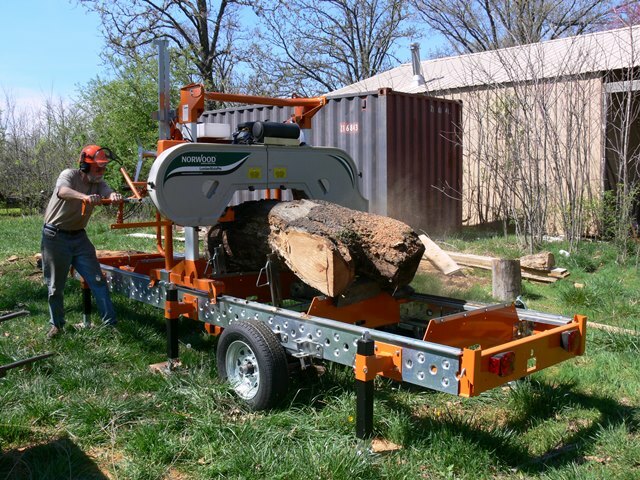 A mill with modular clamps and log stops that can be moved make the job easier, but it may still take some blocks and shims to hold it securely. The first cut or two are the most critical, since the log is least stable. 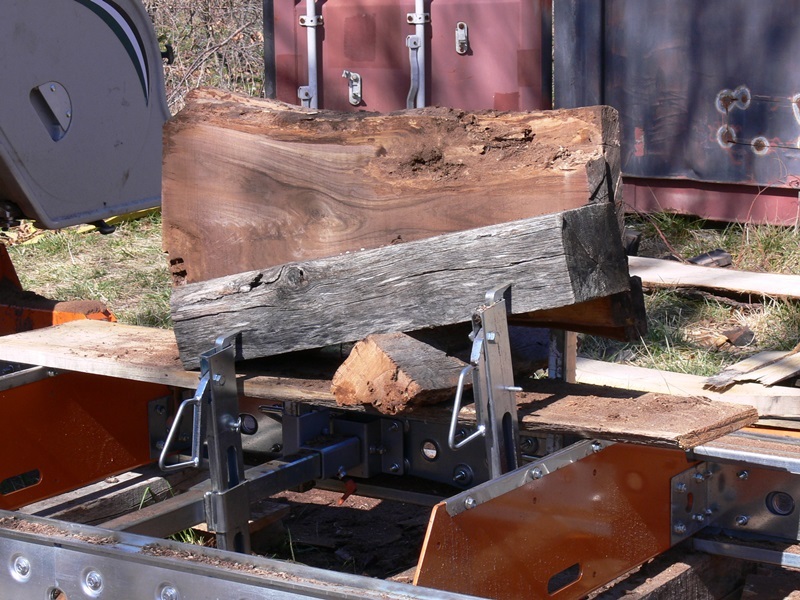 You may need to cut slow and easy to keep from knocking the log loose from the clamps. After you get a flat surface all along the length of the log, turn it over so you have a flat side down. Generally, you will be making slabbing cuts. When you have milled to the center of the log, turn it over again, and finish slabbing it. That scrap that was such a pain in the neck to clamp down just might wind up in a gallery! clamps, as well, depending on the design. If possible, have the clamps and log stops positioned so that you can cut to the middle of the log before you turn it over. When you turn the log over, keep an eye on the clamps, stops, and support boards. The last few cuts may require you to cut through the clamp and stop support boards, so you may wind up sacrificing them in order to cut your log. But you can always use more stickers! Hopefully, you will end up with a beautiful stack of short, fat boards that will find use in a piece of furniture. There are two schools of thoughts regarding curved logs. How you mill them depends on how much curve they have, and how you plan to use the lumber. Cutting straight boards sacrifices some wood, but if you need straight lumber, start with the log curved either straight up or straight down, whichever is more stable. Cut a slab to get a flat surface down the length of the log, then turn it half way around and slab the other side. Once you have straightened out the log, finish milling the cant as you normally would. For smaller logs, or logs with more curve, you might want to just slab off curved boards. These are great for signs, curved benches, and other unusual “craft” style woodworking. Lay the wood so the curve is sideways, slab half way through it, flip it over and slab off the other side. Stacking this wood for drying takes up a little more room, but when the right woodworker comes along, you won’t have any problem selling it for a premium! Use your imagination! If it holds the wood securely, it doesn’t matter what your clamp looks like! Finally, how about “cookies”? 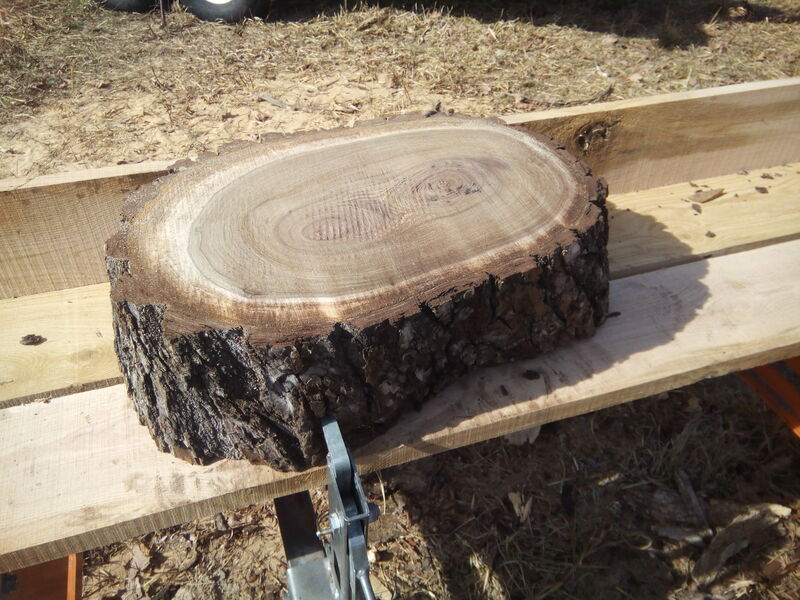 Cutting logs crosswise is a real challenge that can produce grilling planks, cake platters for weddings, stools, table tops, and other specialty products. The problem is in clamping them down so that they don’t spin while being cut (this can put a kink in a blade, rendering it useless). First, you will need a board or two to bridge across the cross bunks to provide a platform. There are a couple of approaches to the challenge of clamping them down. One is to bridge between the clamps and log stops with a couple of boards. If you are doing a lot of cookies, you may wish to have a pair of 10” wide boards, a pair of 6” wide boards, and a pair of 2” wide boards that you can swap out as the cookie log gets shorter. It also helps to do three logs at the same time and put them tight up against each other so they have less tendency to twist as you cut. The other method of holding the cookies in place is to drill holes in the cross bunk bridges and use lag bolts, about 1” longer than the thickness of the cross bunk bridges to bolt the cookie logs to the bridges. With two lag bolts, the log should be secure. Just remember not to cut low enough to cut into the lag bolts! 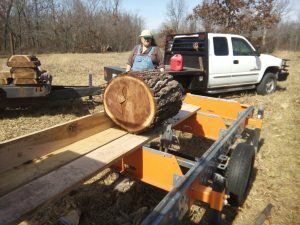 The ingenuity that sawyers use to solve the challenges of cutting oddball logs is amazing! Hopefully, you will take a fresh look at some of those logs you set aside that are too good for firewood, but not good enough for conventional lumber, and turn them into something special!